Then, there's the Bubu (bottom picture). Logan has been working on this avatar for quite some time now, and I've watched every step of the way. At first I was initially skeptical. "Isn't that the Munny?" I asked. 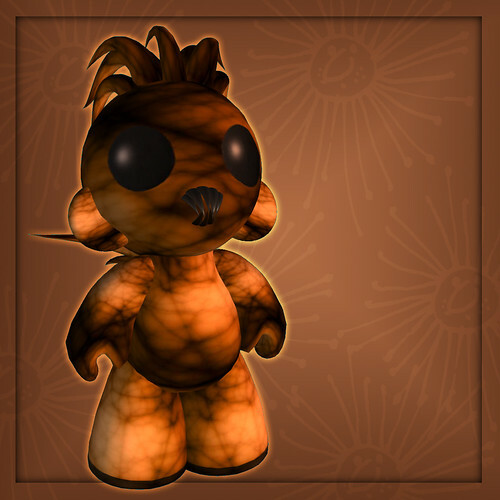 Logan said that he'd always wanted one but isn't able to get one where he lives, so he extended his appreciation for it into SL, where he's enabled everyone to play with the Bubu avatar. He's made it cheap and completely personalizable like the Munny, complete with his own neatly scripted spraycan that shoots a personalized skin over it. In the picture below I'm wearing a personalization from The Stringer Mausoleum-- Helena's turned the Bubu into a cute Elder God, and you can get this skin later today from her shop at Oz. (SLURLS below in credits). You can get a basic Bubu with a personalizable skin today, opening day, at Logan's shop over here. ***Personalizations: The Cthulhu parts are by The Stringer mausoleum, and it'll be available later today at Helena's store on the Oz sim. :D Thank you for the write-up, and I love the Bubu AV!